In January 2007, when the micronation of Sealand was put up for “sale”, the ACFI and The Pirate Bay tried to buy it. 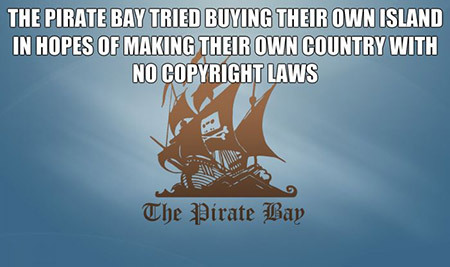 The Sealand government however did not want to be involved with The Pirate Bay, as it was their opinion that file sharing represented “theft of proprietary rights”. A new plan was formed to buy an island instead, but this too was never implemented, despite the website having raised US$25,000 (€15,000) in donations for this cause. Continue reading for more fascinating facts you probably didn’t know.